Will Melanie have to follow her best friend’s narrow dating rules in order to find lasting love? Kaitlin agrees to five dates in five days only to fall for the mysterious bartender who’s there to witness them all. 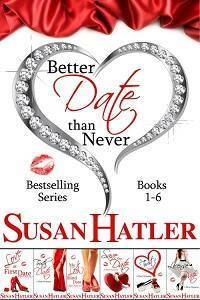 “I LOVE Susan Hatler’s Better Date than Never Series! Each book is fun, romantic and full of familiar characters that I have grown to love!” — Books Are Sanity!!! BETTER DATE THAN NEVER is one of my favorite romantic series. Susan Hatler has a fun, witty, and down to earth writing style that make her books so enjoyable to read. All six books in one boxed set is a steal of a deal and every one of the stories will touch your heart and keep a smile on your face! LICENSE TO DATE (#6): Susan once again delivers a wonderful romance that’s also about great friends who never let you down, but also don’t let you stay down. Kaitlin got the bottom of the barrel with her last romance. “I wouldn’t have dated her if I’d known she was your sister” was his apology for cheating. So she’s taking a break from dating and who could blame her. Her friends, Ginger and Kristen have given her a few months, but think it’s time for her to get on with her life. They bribe her into going on five dates. Each more hilarious than the last, but what they have in common is the Geoffries Hotel and Paul, who is bartending there the night of her first date. Paul is charming, gorgeous, and well, just dreamy and irresistible. Kaitlin can’t keep him out of her thoughts no matter how hard she tries to convince herself she should. Paul was my hero, and Kaitlin’s after the rappelling save and that amazing kiss gone viral. I love how their romance plays out, so sweet, and clearly meant to be. sigh Don’t miss out on this one, it’s a 5 star read!